At Selma, we make sure our customers keep 3 main things in mind when figuring out how to invest for the long run: a cash buffer, plan your spendings and investing the rest. Savings that you might need for unexpected expenses. Have you already planned bigger investments in the next 3â€“5 years? It might make sense to keep this money on your savings account than invest now. Money that stays on your bank account will lose in value does not have a positive impact on your future. Awesome! The first step is done. You overcame the struggle and started thinking about your financial future. â€¦ but before you now go into the details and dig into whether you invest your money in bitcoins, Google stocks or Goldvreneli, let's figure out how much of your savings you should put aside and how much you should invest for the long run. Life is simply unpredictable. Investing money does set you up for a potentially safer future, but you should still make sure that you are well set up for the here and now. For all kind of unexpected events and rainy days, itâ€™s good to keep some cash on the side. A good rule of thumb: Base the buffer on how much money you need to cover your living expenses for 3â€“6 months. This is how you make sure that you are prepared and donâ€™t have to sell any of your investments once times are getting a little tough. Apart from the cash buffer, you might have some money already put aside for specific bigger purchases that are coming up soon. Are you planning to buy a car? Go on a sabbatical to Africa? Need money for renovation? Investing always comes with a risk of losing money as the financial markets can move up and down quite a bit in the short run. In case you are planning on using a bigger chunk of your money already in the next 3 years, it would be better to park it on a savings account or save up for it on a monthly basis. Bottom line: think how much money you'd need soon, before deciding on your investment sum. Invest as much as possible! As soon as you have calculated your cash buffer and your planned spendings, you should invest the rest of the money in order to set up your savings for the future. Keeping the money you donâ€™t need on your bank account is more expensive then you would think. To get most out of your savings, you should invest it for the long run. 10 years or longer preferably. Bank fees and inflation are slowly eating up savings on your bank account. The money would lose in value if you simply let it parked there until you - for example - retire and might need it to buy your villa on Bali. Tip: Check out our case study on how inflation, bank fees and your savings play together. There is another reason why you should invest as much as possible: a magical little mathematical trick called: compound interest. Thanks to compound interest, the longer you invest, the bigger the effect. Every year you earn a return, which is then added to the initial amount - which means you will get more return on that higher amount the year after. Interest on money you already got a return for! Over 10 years the compound interest adds up quite a lot - resulting in an exponential growth of your return. So keep in mind once again: a long investment horizon is key. Financial markets are a friend with those who go for the long run. 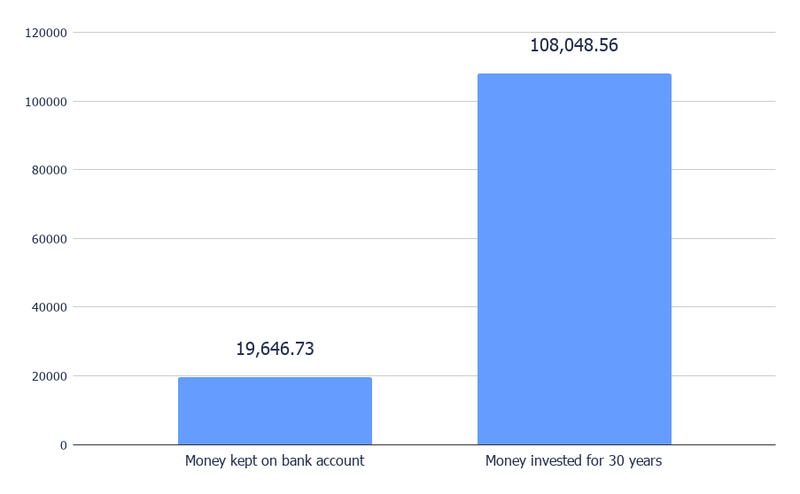 We simulated how much the difference between keeping 25â€™000 CHF on your cash account vs. investing it for 30 years would be. After 30 years you would end up with -5,353.37 CHF less in purchasing power when keeping the money parked on your bank account. Thanks to compound interest (which shines over this long horizon) though, investing your 25â€™000 CHF would earn you +83,048.56 CHF . Our take-away: Invest as much money as possible for as long as possible. Adding monthly savings to your investments also makes a lot of sense - check if transactions with your chosen investment provider are for free! I'll help you figure out the perfect investment amount. And for that I'll come up with the perfect investment plan too.